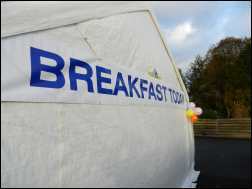 The pancake birthday party on Saturday 3rd December was a great success! Mountains of tasty pancakes and waffles were consumed by over 30 people who helped us to celebrate 10 years of treating pain in and around the Nottingham area towards achieving our goal of becoming the leading Nottingham Chiropractor. Here are some more photographs from the day where everyone thoroughly enjoyed themselves. 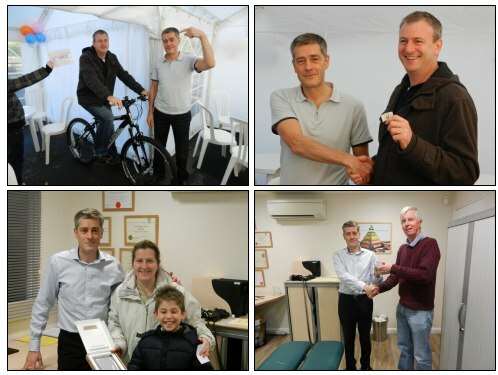 The prize draw winners can be seen below where the winner of the 3rd prize i-Pod Shuffle, the 2nd prize Amazon Kindle and the lucky winner of the 1st prize Trek 4400 mountain bike Roger Davies seen here receiving their prizes from Dr Sanders.